Bank of Canada Raises Interest Rate – Again! Posted October 26th, 2018 by Nazia Khan . Canadians can expect to pay 0.25% more on their interest rates starting October 24, 2018. 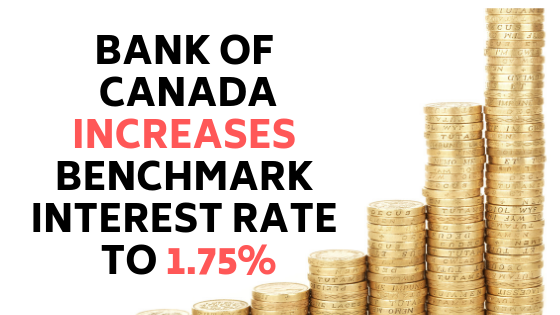 This increase by the Bank of Canada on Wednesday raised the benchmark interest rate from 1.50% to 1.75% – which has already been raised 4 times since the summer of 2017. This was justified by praise to the economy as there has been a revised trade agreement between Canada, Mexico, and United States, and evidence is suggesting that homeowners are adjusted well to higher mortgage loans. Many homeowners and buyers may also face another increase as “the policy interest rate will need to rise to a neutral stance to achieve the inflation target”, outlined in a statement that explained the latest policy decision. More details can be found on, “Bank of Canada inches closer to normal with rate hike – and signals more to come” by the Financial Post. What does this mean for homeowners and future home buyers? Well, now the average Canadian household will be spending more of their discretionary income; the amount left after taxes and necessities are paid. This is an additional $1,715 and can hike to an estimate of $2,516 per household annually once the changes are in full effect. It is predicted to have the worst consequences for the Millennials (born between 1977 to 1995) and some members of Generation X (born between 1961 to 1981) negatively because many have a lower savings amount to begin with and higher debt rates. However, it isn’t all a bad thing. Higher interest rates are a good sign of a strong economy, which would also mean higher household incomes for many Canadians. The rate of 1.75% is still historically low, and the bank of Canada will continue to raise the interest rates gradually into next year. How much will be raised? It will all depend on incoming data and other sources of information for the current interest increase. We are expecting it to raise again sooner as cited by Stephen Poloz, “If we move too slowly to raise interest rates, the economy could move firmly above its capacity limits and inflation could establish significant momentum. We certainly want to avoid this outcome.” To read more about the hike, click ‘Bank of Canada will continue with gradual rate hikes: Poloz’ by Globe and Mail. What this means for new homebuyers? Maybe a more stressful situation and financial difficulties with a mortgage. But we are not too sure. We might have to wait and see how this impacts them and their ability to get a mortgage. Our advice would be to consult with a mortgage broker or a bank to see what your options are.